Cuban artists tackle racism in their homeland in Mattress Factory show. The past two decades in Cuba have seen an unfortunate backslide in the attempted racial and social leveling of the post-revolution '60s. The problem is addressed from a number of angles in Queloides, now on view at the Mattress Factory, under curators Alejandro de la Fuente and Elio Rodriguez Valdes. Translated keloids, the title refers to a type of scar tissue that occurs predominantly on black skin. The exhibition hand-out explains the show is "the statement of a generation of artists who grew up and were educated in an environment that was, to no small degree, racially egalitarian and that deteriorated in the 1990s." From the standpoint of an American (a white male one, no less) who has been conditioned to think of race relations as immune to retrogression, it's an unfamiliar conversation. Much Latin American art is heavily activist, and in a hemisphere still reeling from imperial pugilism, political discourse is unavoidable. Cuba is an especially politicized nation, having been, for more than a century, an arena for those on the sweet end of the hegemonic spectrum. Elio Rodriguez Valdes' "Black Ceiba"
The racial issue, naturally, is handled with a range of approaches by the 13 artists. The photographs by Rene Pena have a subtle emotional potency, deftly interweaving the politics of race, gender and class, while dodging any direct narrative. They are more like scenes than stories, dream-images of melancholy musing, stayed from wandering by their art-historical ballast. In "Death of Black Marat," the artist composes a shot that loosely recreates the pose of the French Neo-classical icon, replacing the slain intellectual with a dreadlocked black counterpart. Instead of a pen, his limp hand grasps a stained toilet brush, and his body drapes melodramatically out of a bathtub lined with old, cheap tile. It is as if Black Marat, lodged as he is in the bowels of the resurrected class hierarchy, is reduced to a martyr of mildew removal. Most of the paintings, and some of the other flat work, engage the prevalent issues less dexterously. The imposing scale of Armando Maniño's oil paintings doesn't fully mask an over-reliance on blunt allegory, and some of Alexis Esquivel's acrylics adopt a facile distribution of Shepard Fairey-style motifs that detract from its finer points. By contrast, several collographs by the late Belkis Ayon, snugly housed in the last room of the third floor of the museum's Monterey Street annex building, are seductive and sharp. Blending indigenous-style textured motifs with Western classical compositions and references, they emphasize the nature of post-colonial culture as an inseparable meshing of the old and the new, the native and the foreign. 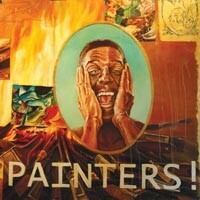 The resulting images impugn the irrationality of racial stratification more eloquently than any firm allegory could. In "Sikan, Nasako, and the Holy Spirit," two regional cult figures placidly share the picture space with a member of the Christian Trinity, manifested as a white dove. The Mattress Factory being a self-proclaimed installation museum, several of the artists have been encouraged to pursue that format. The museum has even gone so far as to use one of the images from the Havana version of the same show -- a watercolor of a '50s-era sedan supported by bare, dark-toned feet -- as the blueprint for a real-life version. The wheel-less, modified Plymouth Deluxe itself is situated, logically enough, in the parking lot of the main building. 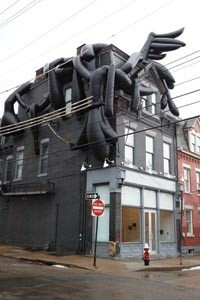 Notable, too, is the amorphous inflatable shape that has glommed onto the top of the annex building. Looking like something between an ebony coral reef and a collection of leeches, "Black Ceiba," a work by co-curator Rodriguez, is too lumpish and imposing to be exactly appealing. But its parasitic attachment to a three-story house is a haunting caveat to a show that ultimately strives less to look attractive than to stake a claim, however fleeting, in the collective psyche.